Serving as president of the National Association of Secondary School Principals (NASSP) has been a tremendous opportunity. It has been an honor and privilege to serve school leaders across the country. I will treasure many great memories from my travels. The people I have met and the stories they have shared will have a lasting impact on me personally and professionally. As I transition from president of a national organization back to a high school principal, I am often asked about what I have learned, my best memory, or key takeaway. This month’s post will share some of those highlights. Our country is facing a crisis. We are in desperate need of quality teachers and principals across our country. I have experienced it in my own school in specific subjects like foreign language and science. During a trip to Oklahoma in the Fall, I learned about how states bordering Oklahoma were offering significantly higher salaries to lure Oklahoma teachers. We saw this issue become a national story with teacher walkouts in Oklahoma, West Virginia, Colorado, and Arizona. Education is critical to the success of our country. Our state and national leaders need to make education a priority. It needs to be in the same conversation as national security. During the selection process for the National Teacher of the Year, one of the finalists referenced the Olympics during her presentation. She stated that every Olympian has a coach. Why don’t all teachers have coaches as well? This was a great point. I believe we should add principals to this statement as well. I have witnessed many instances of principals being hired and provided little to no coaching, mentoring, or support. Many principals I spoke to this year also spoke to the lack of intentional support, especially for first-year principals. According to Wallace Foundation research, leadership is second only to teaching among school-related factors as an influence on learning. Why are we not providing this type of support to our teachers and school leaders? Most school facilities in our country do not meet the needs of today’s learner. During my travels, I visited many schools. Some of the newer schools had great learning spaces. Most were older buildings designed for a different era. This is a huge disservice to our students and teachers. Our students deserve clean, modern learning spaces designed in a manner that encourages collaboration. Key Takeaway #4: Education Is Not Broken! Traveling across the country visiting schools and speaking with school leaders have shown me that education is not broken in our country. In fact, I would say that our students are learning at a higher level than any other time in our country. Yes, we have gaps, especially with minority and ELL students, but educators are doing remarkable things across this country. This needs to be celebrated. School leaders need to do a better job of sharing the wonderful things happening in our schools. #1: We Never Know the Power of Our Relationships! Spending a year away from the Smithfield High School provided me an opportunity to reflect on many items both personally and professionally. One common theme emerged almost daily and it is the power of relationships. We are in a relationship business. Yes, I know there is instruction, curriculum, and assessment we must get to every day but the core of our work is relationships. I think at various times in my career I may have lost sight of the power of relationships. This is something I need to continue to work on. I also think it is something everyone involved with education must focus on. Educators must cultivate and nurture relationships with students, teachers, parents, and community members every day! Everyone has an opinion when it comes to education. The experiences each of us had during our own schooling shapes our view on education. Whether the experiences were positive or negative, educators must do a better job of sharing their personal successes in their classrooms, buildings, and communities. We must be our best cheerleaders. This presents a challenge for educators because it becomes one more thing added to our to-do list each day. As George Couros states, “Imagine if each teacher tweeted out one positive thing each day and we all took 2 minutes to share and read them.” Culture, public opinion, and moral could easily be raised. Let’s make the positive so loud the negative becomes almost impossible to hear! This is tough. I met so many great people and had some once in a lifetime experiences. Again, two events come to the top of the list. One of the reasons I chose to run for president of NASSP was to challenge myself and push my leadership abilities. I took a risk and I made a promise to myself to take advantage of the opportunities this new role would provide. 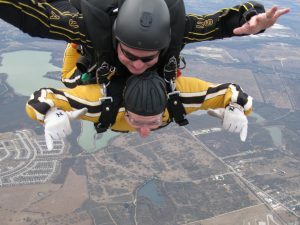 When the opportunity came up to skydive with the U.S. Army Golden Knights during a trip to San Antonio, I took advantage of it. Skydiving was never on my bucket list. I never saw the excitement of jumping out of a perfectly good airplane. I accepted the invitation and I am so glad that I did. It is difficult to describe the emotions as the we climbed to 10,000 feet. When the door finally opened and I stood on the edge peering out onto the horizon, I thought I was going to pee my pants. It was terrifying and exhilarating. The free fall took my breath away. When the shoot opened, it was a quiet and peaceful ride until the landing. I am proud of myself for pushing my limits but I do not think I will jump out of a plane again. NASSP has many great partners in education. The United States Senate Youth Program is one of them. The Hearst Foundation invests a great deal of resources to identify a top male and female student from each state who is passionate about politics, government, and leadership. 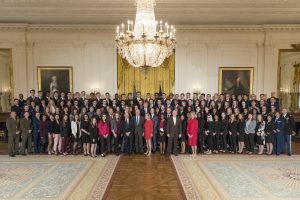 104 students get to spend a week in Washington learning how the government works courtesy of the Hearst Foundation. Students get access to the White House, Capitol, Supreme Court, Pentagon and many other locations. They met Cabinet Secretaries, key military leaders, the editor of the Washington Post, and staff from many museums. They had dinner in the National Archives and lunch in the Ben Franklin room at the Department of State. It was truly a once in a lifetime experience. I was so fortunate to be part of it. I spent over an hour listening to Supreme Court Justice Gorsuch speak in the Supreme Court. I spent time listening to the Director of National Intelligence and the Deputy Secretary of Defense in the Pentagon. I also visited the 911 Memorial at the Pentagon. So many great experiences that I will treasure. I have so many people to thank for their support during this experience. JoAnn Bartoletti – Thank you for your support and guidance. I appreciate your leadership and trust. Beverly Hutton & Dennis Sadler – Keep up the magnificent work leading our organization. Bob Farrace – Thanks for making me look good on the road! Felicia Fett & Patty Kreutz – Thank you for the assistance and guidance the past five years! NASSP Staff – You all work so hard for school leaders and students across the country. Your work does not go unnoticed. Thank you for working hard each day to support our mission. NASSP Board of Directors – It has been a pleasure to work alongside you. Thank you for your support. Ken Hopkins, Linda Murphy, & Tammy Koller – Thank you for holding down the fort in my absence. SHS Staff – Thank you for all you do for the students of Smithfield. You guys rock! Lee & Eileen Drury – Thanks for helping with the kids when I was on the road. Michelle Kelley – My awesome wife. Thank you for supporting me on this journey. I know it was not easy for you. Please know that I appreciate you and love you very much! Andrew & Caitlin Kelley – Thank you for being great kids! I look forward to seeing more of your games next year. Keep working hard!